A new schedule for each month, reassessed according to progress, or a full 5 month programme? 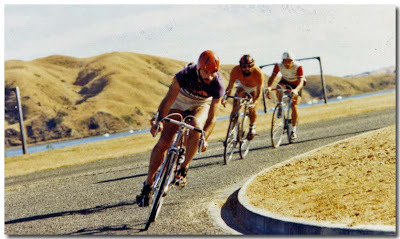 Photo: Gary making his move during one of the PNP club's 40km cycle races around Aotea Lagoon circa 1980. From 1978-83 he averaged 3rd-4th placing in multisports races in NZ (run, bike kayak), due mainly to experience with club-based racing in all three disciplines. Message: If you want to get good at a discipline, then you really should be competing in that sport against better competition. Can train during lunch breaks (limited to 50mins) and could train in the mornings if required. Evenings are mostly free but constrained by transport, so training best done at home. Would like to get started on it as soon as possible now, given the legs seem to be better. I purchased a Triathlon wetsuit on the weekend, so am ready to start triathlons now, and was thinking about the Scorching Bay one on Sunday as a starting point. Note – should we include a combination of the below? Turbine training on Thursdays (8.5km of hilly off road running). There’s a clash of events in January and March. Sat 21st – Lake Taupo Relay Race – would do approximately 20kms. Sat 2nd – Rotorua Marathon - ? if I don’t aim for Rotorua, possibility of team event in Crazy Man –18km mountain run only. Nice and motivated, so looking forward to the programme! Sarah, I do not like schedules, including dictating time and distance because the human body does not work that way: It varies so much in what it can handle from one day to the next and from week to week. It is better to set yourself a weekly framework with general guidelines and to listen to your body. It will tell you each day whether to do more or less; to go faster or slower. As strength and fitness improves, so will the quality and volume of the training - It will just happen naturally. To improve fitness of any of the three disiplines, train at it 3-4 times a week for about 4-6 weeks. To maintain fitness achieved in any of the three disciplines, train at it 2-3 times a week. Do not repeat the same hard workout on consecutive days. The cardiovascular system recovers in about 36 hours whereas the muscluloskeletal system takes about 3-5 days. So, if you hammer your legs in a hard run, swim the next day and then cycle the next, then swim, the next, then be back into full running (You can jog easy on those recovery days). The more nutrient rich food that you can eat, the more training and racing you can do and the better you will get. When not training or eating - rest! And get a weekly massage. Make about every 4th to 6th week a lazy restful one - train but make it minimal - fit this week in with when you feel a bit off colour, when work is hectic or when your period is heavy. If you want to get really hard and efficient at a sport, then train with the pros - join a cycling club and get involved in their local races. Join a running club and do their summer 5km series. Join a swim squad and do drills with the speedsters. Concentrate most of all on improving the event you are weakest at. In the swim triathlons, you must be a strong swimmer to have any hope of being competitive, so work on your swimming. Practice racing triahtlons at every opportunity by entering tri and duathlon races that you can play at without wasting yourself while practicing competition skills like swimming, cyling and running in congested surroundings and making slick transitions. Triathlons, swimming and clycing are much easier on the body than running. For about every 2km raced running, you must take one day of relative rest. For cycling and swimming, take a day rest for each 10km and 1km raced respectively. If you do a two hour triathlon hard, take about four days of easy recovery days, then take another 2-4 more days to steadily ramp up the workloads back to normal. Be flexible and listen to your body: If it really does not want to train hard then take it easy or have a rest day. Do not put all your eggs in one basket: Enter every race you can and have a great time over Summer and Autumn traveling the country soaking up the thrill of exotic and challenging events. If you have a race that is really gruelling, like the Gutbuster, that is not your big one for the season, then do it as a team rather than risk wasting your body and wasting far too much time recovering. Consider the long cycle as your principal endurance training for the week. So long as you do quality running durign the week, there is no need to hammer the legs doing extremely long runs that carry a high risk of injury. When doing the weekly Splash and Dash races you can do these as fast as possible if you are feeling good becuase these are so short recovery will be very quick. If racing the 5km, then make about evey 3rd one an attempt at a personal best. Other times, play the race by running parts very fast and other parts just jog. You can run the first few Km hard, plod the middle part, then race the last km hard. Got the idea? These short fun races really hone top end speed that will pay huge dividends during the longer races. You could also look at going to the cycling velodrom on Sunday afternoons and joining in the club practice sessions. Even though you will be tired from your long Sunday am cycle, the track work will develop impressive top end cycling speed that will make triathlon cycling a breeze! This is easy: Have two days of rest in the leadup to any races and make any races on the tuesday easy and playful and not much more than that. When racing, do not waste yourself. Have fun. Enjoy the occasion and ensure that you are not so wasted as to spend weeks recovering. You can go totally hard out during the final one or two big events of the season. Make the day following a race a complete rest and then ease back into full training over as many days as is necessary to feel your post-race recovery is as good as complete. Hey - who cares! Just enter those events that grab your imagination and get you excited. You will be fit enough to do any of the races listed above. The only thing is to concentrate mostly, but not exclusively, on the type of event you are most serious about. So, if it is the triathlon, then generally favour triathlon related events. Go for it! After the Xterra, recover a few days then step up the running and back off on everything else. Run up to 2 hours three to four times a week with an easy early morning jog thrown in daily. Peak with 10 days to go then reduce to the point of doing no more than your easy morning jogs with 2-3 days to go. Go to the E-books section of my website and read my E-book about training for a marathon and the ones on nutrition and the Lydiard Method. Also have a read of my recipes.